One Wednesday in April (check back for date) 7 – 8:30 p.m., $20. Join us at Gumbo for a music healing circle facilitated by celebrated musician/music healer Kevin Nathaniel. Come as you are and together we will chant, sing, move, and breath a healing harmonious vibration to uplift the universe that is both within and without us. 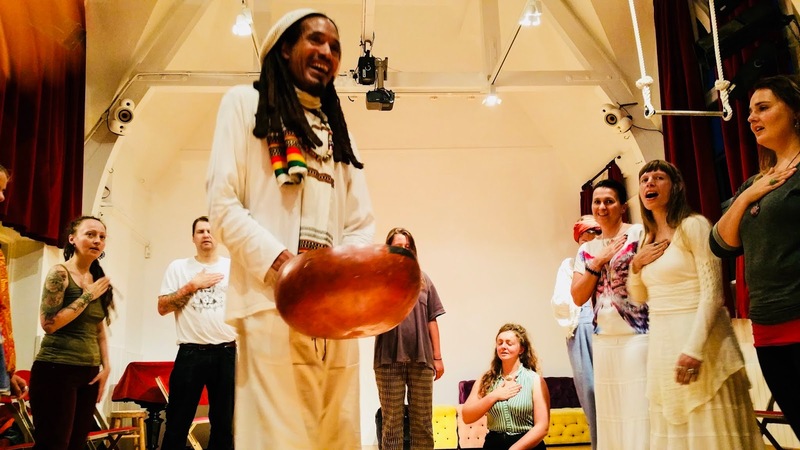 The circle will be participatory, and will include musical prayers, circle songs, mbira songs, dances, and healing breath rhythms from many traditions and inspirations including Africa and its diaspora. Music has the potential to be the most effective of healing modalities. Let's step into that reality together as we step into a magical world. Kevin Nathaniel is a Scholar of the House of Yale University. Following Yale, Kevin intuitively devoted himself to the healing music of Africa, especially mbira music. He began constructing instruments, transitioning to vocal music, the playing of various instruments of the African and diaspora world, dances of Africa, and sacred healing music. His journey has led him to today, where he is an innovative force in the development of shamanic music, performing healing music festivals and ceremonies the world over. His recordings have developed a strong following among the healing and natural medicine world, while healers have verified that his recordings and performances helped heal trauma, sleep disorders, physical pain, depression and anxiety. Kevin has worked with shamans, channels, doctors, healers, mystics, and medicine people from Africa, Asia, South and North America. He has also worked with Alice Walker, Oprah Winfrey, Jonathan Demme, Madonna, Niles Rodgers, Ephat Mujuru, Dumisani Maraire, Bobby McFerrin, Maestro Manuel, Tito La Rosa, Nana Vasconcelos, Carlos Roberto, Miriam Makeba, Thomas Mapfumo, Dr. Mitch Gaynor, Pedro Cruz Garcia, Titos Sompa, Chief Bey, and Omega Institute.